Perfect getaway at the foot of the Beartooth Mountains! Beartooth Byway/Top of the World pass OR via the Chief Joseph Scenic Byway. 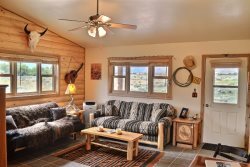 Tatum’s Haven is also convenient to the Big Horn Canyon and other local treasures. other modern day amenities, such as Direct TV, DVD, telephone, and wireless internet. Well behaved dogs are welcome with the payment of a pet fee. Sorry we can't allow cats at this property. People were polite and friendly. Our stay at Tatum's Haven was exactly what we were looking for--a comfortable cabin in a beautiful and private setting. Loved our time there! It was a beautiful stay. Beautiful views, yet easy to get to and easy to get to surrounding attractions. The lady that helped us was very accommodating and went out of her way to make us feel welcome and part of the family. Charming, cozy, comfortable and very well stocked. Love the decor. We have stayed with many times, anytime we've had trouble you've gotten right on it. I like that! Well, equipped, clean and well decorated. Will be back again. Nightly rates are based on an occupancy of 4. You will be charged an extra $15/per/night for additional guest. - A lodging tax is assessed on your rent rate and cleaning fee. - A cleaning fee will be charged to your reservation. - A $39 damage protection policy provides $3,000 in damage protection during your stay. You may decline this charge, but may be assessed a minimum $250 refundable deposit.